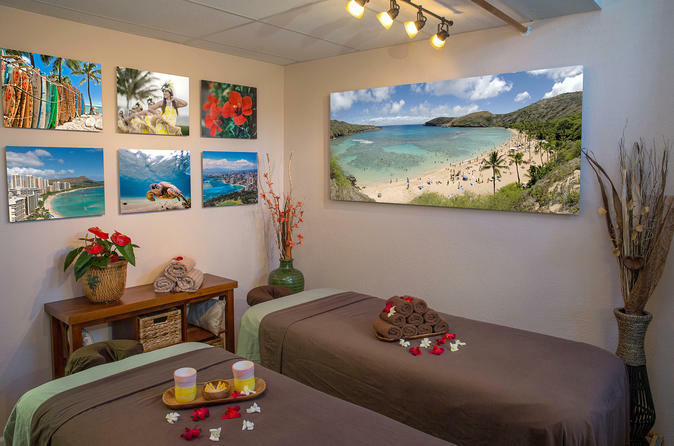 Hawaii Natural Therapy offers two couples room, Oahu and Maui. These rooms are spaciously equipped with separate beds to provide the best care to our clients. During the shared 90 minute massage experience, a therapist will be assigned to each individual so the services can be done simultaneously. Each individual will receive a unique 90 minute massage tailored to their needs. Massage is known to reduce stress, sore muscles, tension, pain and stiffness while improving circulation, boost immune system, and contribute to overall good health. These sessions allow both individual needs to be treated while sharing a transformative space. Couples who strive for s healthy lifestyle can enjoy the benefits of massage together. All of the packages at Hawaii Natural Therapy can be booked as a couples treatment. Massage can be the perfect way to accomplish two goals at once; bonding time and relaxation. Coordinating a session with a partner allows these individuals to come together when busy schedules become hectic. A couples massage can also be convenient for other celebrations such as a bridal party, birthday, or anniversary.